I read this book a very long time ago, but recently it came back to my attention after reading that Sarah Waters had read it, calling it "the first dark germ of The Little Stranger" (one of my favorite books of all time) and a source of research for her The Night Watch. 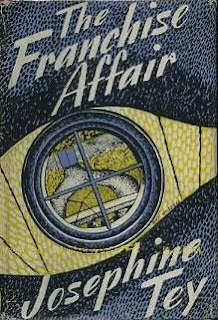 I've recently been running a series of readings of work by women writers of the Golden Age on goodreads, and I've included The Franchise Affair in the list of five novels after books by Agatha Christie, Margery Allingham, Ngaio Marsh and Dorothy Sayers. There's still time if you want to get in on the discussion (let me know) -- because of my vacation we don't actually start until November 15th. The Franchise Affair is just a perfect gem of a novel, based on the real-life case of Elizabeth Canning in 1753 which you can read about at the Guildhall Library Blog. Moving the case into contemporary times, Tey also updated this story to reflect various postwar concerns, as Sarah Waters calls them, "moral panics - about 'problem' children and juvenile delinquency, for example - of postwar life." The main focus here is on the young Elisabeth Kane (Betty - 15), who had gone off to a suburb of Larborough to visit an aunt over a school vacation. She'd kept in touch with her guardians via postcard for a while, reporting that all was well enough to merit her staying on with her aunt for a while. Her guardians figured that with the school holiday ending in three weeks this shouldn't be a problem, but when she doesn't turn up again at the end of the three weeks, they start to wonder what's going on and write to the aunt to make her come home. The aunt writes back (rather than phoning or sending a telegraph) that Betty had left for home some two weeks earlier; by communicating via the post, a lot of time was lost and by the time the guardians went to the police, Betty had been missing for four weeks. Then out of nowhere, the girl returns home, in a "state of complete exhaustion." Her story was that she'd been "kidnapped in a car" and then two days later she reveals that she'd actually been kidnapped and held by two women who tried to force her into domestic service. Inspector Grant is sent to interview the two women in question, Marion Sharpe and her mother, who claim to know nothing about Betty and fervently deny any involvement. But things don't look good for the Sharpes who live at a house called The Franchise, since Betty can clearly identify items in the house, the room she was supposedly held in prior to making an escape and even the different-colored tire on the car that supposedly used in her abduction. Marion Sharpe calls on lawyer Robert Blair, who wants to fob her off on a more criminally-experienced solicitor but changes his mind on meeting the Sharpes and hearing what he considers to be an absurd story. He makes it his mission to prove Betty Kane is lying, but gets nowhere before the local tabloid drags the Sharpes through the mud, making Betty out to be a pathetic, innocent victim, garnering sympathy from all of the country. He has an uphill fight on his hands, one that is made worse little by little as the novel progresses. 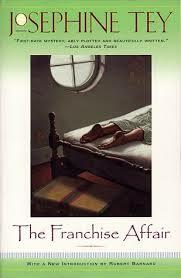 To say that The Franchise Affair is a good book does it absolutely no justice. To me, it is one of her very best works, and I've read them all. Not only does it shine in terms of plot and plot turns, but Tey is also examining postwar British society here. I can't really divulge much about Betty Kane without ruining things, although what Tey has to say about her in a cumulative way reflects the dangers someone of her sort represented to the social order of the time. The English public is also looked at here -- the tendency for tabloid readers to believe what they read and make judgments based on their impressions with no real facts strikes a chord with our own times of sleazy tabloids in print and online, as well as the non-questioning sheep who believe everything that comes out via social media. Tey's novel also reflects the tendencies of those same judgmental people to make trouble for those under media scrutiny. And then there's Robert Blair, the attorney who is "usually so placid, so lazily good-natured," but discovers that with the Sharpe case, he has a "focus of interest," changing "the pattern of his life." Used to a somewhat prescribed lifestyle "without hurry and without emotion," he finds himself actually feeling alive with this case, quite possibly for the first time. The Sharpes live in a big house that once upon a time had seen better days; now they barely scrape by without servants or money but there are still certain forms that need to be maintained for eyes outside of their gates. There's so much more to talk about with this novel, but well time and all of that. The Franchise Affair can be read by mystery/crime fiction readers across the board, except for those people who trend toward kickass thriller stuff ... it is so well done that it will appeal to pretty much everyone. Tey was a gifted writer, but in this book, she's gone beyond her norm and given readers a book that should, in my opinion, be considered a classic. It is an incredibly superb book that all aficionados of British crime fiction/mysteries should read. If you would be interested in the new biography of Josephine Tey by Jennifer Morag Henderson, please contact keara@sandstonepress.com. I will absolutely do that. Thanks! I agree wholeheartedly, Nancy. I love this book. I have read it twice, and want to read it again. Maybe in 2016. I had forgotten exactly how excellent this book is, Tracy. It was the only book I read during my vacation that made me forget I was in the Caribbean.